Obviously we have some work to do. The question that comes to mind is why do we always hear that Social Security is running out of money but we never hear that the Welfare State is running out of money. I think it is truly time to examine the bureaucracy that support each. I suspect we could save some serious money there without hurting the people who truly need government assistance. New Bern, North Carolina, is a beautiful city (rebuilding after Hurricane Florence). Obviously, rebuilding is costing a lot. The City Alderman are doing a good job of trying to repair the damage done by the hurricane, but it is costing a lot. In addition to the cost of the hurricane, New Bern is now faced with the cost of a U.S. House District 3 primary election, possible run-off election, and off-year election to replace Congressman Walter Jones. That has brought up the issue of the cost of elections–they are expensive. In the March 21-27 issue of The County Compass (I could not find the letter on the website, I actually have the paper. This is a link to the website. ), New Bern Alderman Jeff Odham explained a way that the City of New Bern could save money on elections and increase voter turnout in municipal elections. New Bern normally holds its municipal elections in October every four years (2013, 2017, 2021, etc.). Alderman Odham proposed holding municipal elections in March during federal election primary elections. This change would decrease the cost of municipal elections from roughly $36,000 (if there is no runoff) or $55,000 (if there is a runoff) to less than $5,000. What a fantastic idea. If the elections are held during the primary, the runoff can be held during the general election in November, again at a cost of less than $5,000. This resolution would have to be approved by the Board of Aldermen and sent to Raleigh so that the legislature could modify the charter of the City of New Bern. Last night the Board of Aldermen rejected the resolution. Among other things, the proposal would result in the current Board of Aldermen serving a three-year term instead of a four-year term. A number of the Aldermen objected to that. They were willing to cost the taxpayers thousands of dollars in order to serve for one more year. The Aldermen that voted against the proposal were Aldermen Best, Aster, Harris and Bengel. Mayor Dana Outlaw, Alderman Kinsey and Alderman Odham voted for the proposal. It is unfortunate that the other Aldermen were not interested in a savings of at least $30,000 every four years. I will not be voting for my current Alderman (who voted against the resolution) in the next election. Walter E. Williams is a professor of economics at George Mason University. I heard him speak many years ago when one of my daughters received a degree from Northern Virginia Community College. He is a brilliant man. On March 16th, Professor Williams posted an article at the Daily Wire. The article deals with the idea of redistributing wealth. In a free society, people earn income by serving their fellow man. Here’s an example: I mow your lawn, and you pay me $40. Then I go to my grocer and demand two six-packs of beer and 3 pounds of steak. In effect, the grocer says, “Williams, you are asking your fellow man to serve you by giving you beer and steak. What did you do to serve your fellow man?” My response is, “I mowed his lawn.” The grocer says, “Prove it.” That’s when I produce the $40. We can think of the, say, two $20 bills as certificates of performance — proof that I served my fellow man. The last example shouldn’t even be legal. Take a look at the website Billionaire Mailing List’s list of current billionaires. On it, you will find people who have made great contributions to society. Way down on the list is Gordon Earle Moore — co-founder of Intel. He has a net worth of $6 billion. In 1968, Moore developed and marketed the integrated circuit, or microchip, which is responsible for thousands of today’s innovations, such as MRIs, advances in satellite technology and your desktop computer. Though Moore has benefited immensely from his development and marketing of the microchip, his benefit pales in comparison with how our nation and the world have benefited in terms of lives improved and saved by the host of technological innovations made possible by the microchip. If you want to be a millionaire, find a need and fill it. That is the proven method. Yesterday The Wall Street Journal posted an article about a recent statement from New York City Mayor Bill de Blasio. Wow. So it’s wrong for the money to be in the hands of the people who actually earned it? • Perhaps he means David Koch, the retired businessman and libertarian who donated the entire $65 million cost for the new public plaza in front of the Metropolitan Museum of Art. The more than six million people who visit the museum each year can now stroll past trees and fountains on their way in and out of the Met, which by the way is also supported by private donors. • Or perhaps the mayor is thinking of Ken Langone, the Home Depot founder, who has donated hundreds of millions of dollars to the New York University Medical Center that treats patients of all incomes and social strata. Mr. Langone’s most recent $100 million gift, made last year, will go to provide cost-free tuition for every NYU medical student. Wrong hands? • Or maybe the mayor has in mind Richard Gilder, who made a fortune in finance and provided the first major grant for the Central Park Conservancy that has rescued the park from its sad mid-20th-century decline. Each year the conservancy, led by private donors, restores eroding corners of this grand public space with new trees, lawns, playgrounds and ballfields that are used by tens of thousands across the city regardless of income. Mr. Gilder has also given generously to the American Museum of Natural History and the New-York Historical Society, two other favorites for visitors and students of all ways and means. • Then again the mayor dislikes charter schools, so perhaps he means Stanley Druckenmiller, the legendary investor who has donated hundreds of millions of dollars for Geoffrey Canada’s successful charter-school network in the poorest neighborhoods of the city. These students would otherwise be stuck in failing schools run by Mr. de Blasio’s friends in the teachers union. But thanks to donations from Mr. Druckenmiller, and hedge-fund operator Dan Loeb’s gifts to the Success Academy charter network, thousands of kids have a shot at a better life. The article reminds us that because of capitalism and the fact that when men can keep the fruits of their labor, donations are made that educate children, improve neighborhoods, and provide playgrounds and recreation. As for Mr. de Blasio’s right hands, there are those failing schools. And don’t forget the New York City Housing Authority, which last year had to sign a consent decree with the federal government for lying about its failure to provide safe and sanitary conditions. Perhaps those are the hands Mr. de Blasio should do something about. Yesterday The Blaze posted an article about three students in New York who purchased a couch from the Salvation Army for their apartment. The couch was not particularly attractive, but it fit the space in their apartment. As they were trying out the couch, they found a plastic envelope of money under one arm. At that point they began searching the couch. After twenty minutes, the trio had uncovered $40,000 in cash. On one of those envelopes contained a woman’s name. After each of the students spoke with their parents, they decided to attempt to reach the woman named on the envelope. Werkhoven’s mom found her number in a phone book and the group gave her a call. She answered. “Oh, I left a lot of money in that couch,” the unidentified woman said. “When we handed the money back to the woman, she told us that she felt like her husband was present in the room with us,” Guasti told the Rebellion. The woman told the Rebellion that her husband gave her money each week before he passed away and she had hidden it inside the couch. However, when she had an operation on her back and was away for several months, her daughter sold the couch and replaced it with a full-size bed, following a doctor’s advice. There are a few lessons to be learned from this story. The first is don’t sell your mother’s couch without asking. The second is that there are honest people in the world. 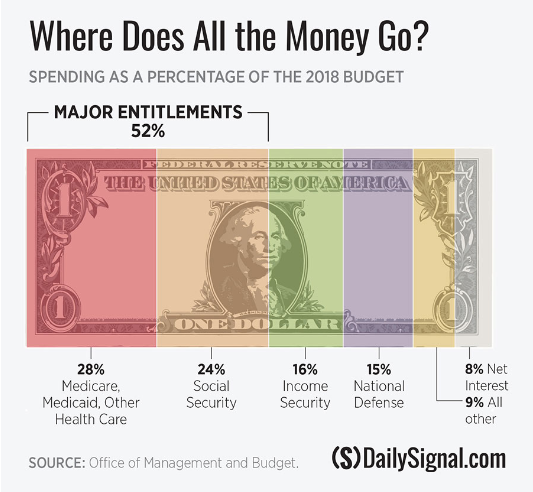 Somehow because of the size of our government and the amount of money taken from taxpayers to run it, we sometimes forget what some of the spending represents. Every now and then it’s a good idea to look at a story that illustrates where the money goes and why. Here is a story that explains one aspect of government spending. Stacy Huisman posted an article at Militaryspouse.com recently. The article explains how the recent budget deal will impact her husband’s retirement pay and her family. The money cut from his retirement pay was the money they had planned to use to pay for their children’s’ college education. Please follow the link above to read the entire article. It illustrates beautifully the price our military families pay when one of their family members serves in the military. There are a few aspects to the cut to retirement pay. First of all, that retirement pay was promised to our military when they signed up–they earned it. It was assumed that the cost of living increases in that pay were included in that promise. There is also the aspect of the price military families pay for having a family member in the military for twenty or more years. One on my own granddaughters is in fifth grade. She started attending her third elementary school in six years in September. Another granddaughter is in third grade. She is attending her second elementary school in three years. That is a high price to pay. She is living near her grandparents (my husband and I) because we chose to move to be close to her family–not because her family had a choice as to where they would live. The thing that really bothers me about the budget deal is that military retirement was cut, but civil service retirement was not cut. Public sector workers make more than private sector workers to begin with. The public sector workers are now required to contribute a small amount to their pensions–something private sector workers have been doing for years, but they are still better compensated than the private sector. The chart below is taken from a 2010 post by the Congressional Budget Office. 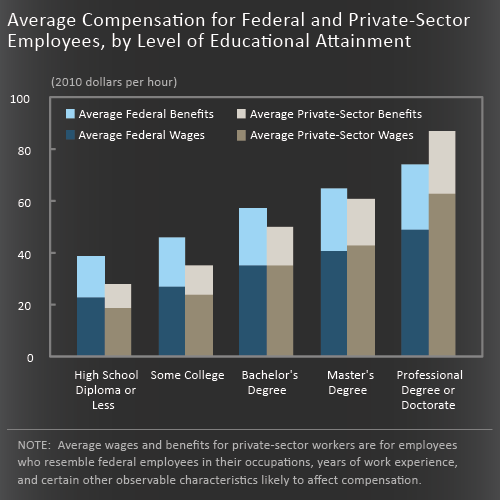 As you can see, unless you have an advanced degree, it pays to work for the government. The budget did not need to be cut at the expense of our military–there was enough pork in the public sector to avoid breaking a promise to those military families who serve our country. On Saturday the Washington Post posted an article about some of the end-of-the-year spending done by government agencies. The spending is a result of one of the side effects of baseline budgeting, which is something our government needs to get rid of. Baseline budgeting is the concept that a department’s budget is based on how much money they spent in the previous year. If they spend 90 thousand dollars and their budget was 100 thousand dollars, the department budget will be 90 thousand dollars in the following year. If they don’t spend all of the money in their budget, their budget is cut. This creates a mad rush to spend their entire budget by September 30, the end of the fiscal year. If they spend the full amount and ask for a 10 percent increase and get a 5 percent increase, that is considered a 5 percent budget cut. That is how Congress can claim they are cutting the budget while the spending continues to increase. These two concepts explain some of the rather interesting end-of-the-year spending done in the past few weeks by the government. As you read this, remember that this is under sequestration when Democrats are complaining that there is no money. This is not a reasonable system. There is a spreadsheet at adelphi.edu that shows the federal deficit over the years. When President Obama took office, the deficit was approximately 12 million dollars. The deficit is now approaching 17 million dollars. That’s a pretty hefty increase in five years. However, the really interesting part of the spreadsheet is the relationship between the deficit and which party controls the House of Representatives. Remember, the House controls the spending. Please follow the link to the spreadsheet and take a look at the history of the federal deficit. At any rate–baseline budgeting needs to go.